Alarm bells must ring about the food security situation in Tamil Nadu as the acreage of paddy cultivation has been steadily and surely coming down, with the decline being one third compared to 1980. 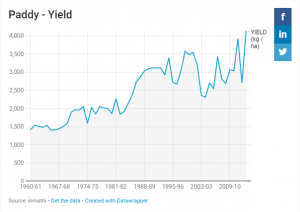 The only saving grace is that the yield of paddy per acre has increased sharply which explains why there is no rice scarcity in the market. Also, rice comes in from other states as well although the rice price in the open market continues to make a big hole in the budget of the middle class. However, this situation cannot continue for long as the present trend of moving away from paddy and foodgrains to cash crops, and selling agricultural land to the real estate market will increase sharply as will the population of the State. As population rises steeply, largely due to migration from other states, and area under paddy keeps coming down, the pressure on the food market will double in the coming years and could cause a serious food crisis. 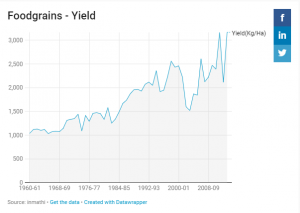 Even assuming paddy production continues to remain at present levels despite drastic fall in acreage, in terms of per person, the rice availability in 2041 would be only 57.39 kg as against the availability of 119.79 kg per person in 1980. In 1979-80, paddy was grown in 29,06,440 hectares or 29.06 lakh hectares but this figure came down to about 22 lakh hectares in the late eighties, to about 20 lakh hectares in the nineties, and dropped to 17 to 18 lakh hectares in the present period. 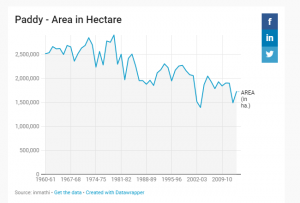 Similarly, for the same period from 1979-80 which saw acreage under foodgrains at 52,52,735 acres or 52.52 lakh hectares, the area has been shrinking and is now reduced to about 34 lakh hectares. This is again a sharp decline of over one-third in terms of area, although the situation is saved by the increase in yield per acre. 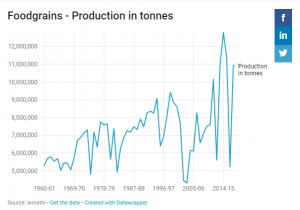 Governments can justifiably claim record foodgrains production, to touch 110 metric tonnes in the last few years, largely due to yield increase. The average paddy production in the last seven years is about 63 lakh tonnes. This has caused complacency in government circles. 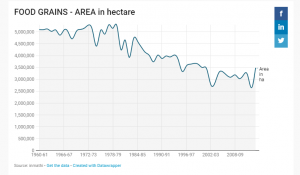 However, the story of decline in acreage under paddy and the decline in production in terms of per capita, tends to be pushed under the carpet. From 1961 to 2011, Tamil Nadu population has more than doubled in the last 50 years, and the population growth per decade now is over 15 percent. Population projection of Tamil Nadu in 2021 is about 8.30 crore in 2021, and 9.54 crore in 2031 and 10.97 crores in 2041. The Census Report of 2011 has projected that the population of Tamil Nadu could touch 8.57 crore in 2021 as there is a big influx of people moving into the State due to growth in infrastructure, construction, manufacturing and higher education sectors. Many demographers cite drop in Total Fertility Rates – at the rate of 2.0, as many people are born as will die, implying zero growth — and say the population is likely to decline even from 2031. The Indian population as a whole, though projected to rise steadily until 2051, will start declining in Kerala and Tamil Nadu from 2031 and from 2041 in Karnataka and Andhra Pradesh, feels K Srinivasan, President, Indian Association for the Study of Population. However, a reality check reveals that though the Total Fertility Rate (TFR) in Tamil Nadu has gone down to 1.6, far below 2.1, and though crude birth rates are lower than crude death rates, the population in the State is going up due to factors like migration. The Census report of 2011 clearly confirms this: The Census report on the population growth and present projected growth of over 15 per cent is described thus in the Census report 2011: “However, the present increase in growth rate in Tamil Nadu may (be) due to increase in migration of population from other States to Tamil Nadu and this could be owing to variety of factors such as industrial and economic growth leading to more opportunities in the construction services and manufacturing sectors and availability of educational opportunities in the State”. “The state has a growth rate of about 15 percent which will continue to rise due to the rise in infrastructure and development index of the state as a whole. Thus the population of the state is rising considerably given the progress in the state”. Under these circumstances, 2041 could see rice shortages with paddy production per person expected to come down further to 56.65 kgs, for a projected population of 11.12 crore – assuming present growth rates — as against projected paddy cultivation of 63 lakh tonnes. At 56 kgs per person, the per capita paddy production could be less than half of the 1981 figure of 119 kgs. This means that the availability of rice per person would be only half of what was available in 1980. This could create considerable pressure on food management as rice is the staple food of the average person in Tamil Nadu. Even out of this quantum, a lot of rice would not be procured by vested interests in the markets who would point to high moisture extent or other excuses. There is also the reality of rice being clandestinely exported to other states particularly Kerala. The agriculture department has to come up with solutions like incentives, special pricing mechanisms, subsidies etc to promote paddy cultivation to stave off a major food crisis which is just around the corner. A section of the lower middle class had over the last two decades moved away from buying rice at the fair-price shops under the PDS and were buying rice in the open market due to rising standard of living. However, with falling paddy production, higher export of rice to states like Kerala, the rice availability in the public distribution system could also come down. One cannot blame farmers for moving to cash crops or selling their paddy to markets outside the State if they get more remunerative prices. In that situation, open market prices will hit the roof, forcing the lower middle class to move back to the PDS, and seek ration rice from fair-price shops, using their ration cards. The PDS could come under strain, the open markets may squeeze the consumer, and the State Government may have to incur huge expenditure by importing rice from other States at high costs and maintain the PDS and the noon meal scheme for school children. This could also cause a financial burden to the State Government. Already, the government is trying to reduce offtake of rice from the PDS, and trying to create categories like Above Poverty Line (APL) to cut down on supply through its fair-price shops. 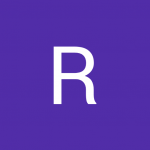 This topic contains 0 replies, has 1 voice, and was last updated by Rangaraj 8 months, 1 week ago.